Many people spend their entire lives trying to be the first—the first to cross the finish line, the first to get married, the first to buy a house. 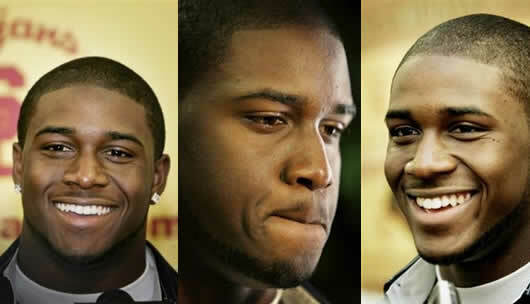 NFL football star Reggie Bush is no different. A 2005 Heisman Trophy winner, he and teammate Matt Leinart were the first pair of Heisman Trophy winners to play together in a Rose Bowl. In February of 2010, he led the New Orleans Saints to their first NFC championship, their first Super Bowl appearance, and their first Super Bowl Championship. This month, he will make history again by becoming the first player in the 75-year history of the Heisman Trust to have the trophy stripped away from him. How’s that for a first? USC must disassociate itself from Bush, permanently, meaning that to USC, it will be like he never existed. Now, that must hurt—to see three years of your hard work, sweat and pain disappear, over night—to be told that what you dreamed about as a boy and worked together with your teammates to accomplish is gone, with one decision. It must be painful to have the school that you essentially gave your life to for three years publicly disown you, forever. Or… maybe not so much. For Bush, maybe it was never about love for USC, or love for his teammates, or love for the game. Maybe it was all for the love of money. Money was what motivated him, after all, to break NCAA rules and accept presents and monetary gifts from sports agents, including a limousine ride to the 2005 Heisman Trophy ceremony. And money was what motivated him to leave USC one year early to enter the NFL Draft. And wasn’t money what enticed him to endorse adidas, Pepsi, Subway, and GM? Now it’s irony that lifts its head, shaking in disapproval, because it’s allegations that Bush and his family failed to repay money to sports agents that gave the NCAA the information that it needed to catch Bush. If Bush had paid these agents the money that he had promised to repay them, they most likely wouldn’t have helped the NCAA in its investigation. But if Bush hadn’t taken the money to begin with, then there couldn’t have been an investigation because there wouldn’t have been any wrongdoing. given him if he didn’t have a history of dishonesty and selfishness. I hope that all of this has caused Bush to take a look at his past to create a better roadmap for his future. (Doesn’t that sound like a political campaign ad?) If so, he can accomplish another first—he can be the first professional athlete of late to realize that character does indeed count.